We have just posted dates for all our upcoming classes and have three new International Teachers booked as well! Lots of fun crafty classes to keep yourself busy over the summer. 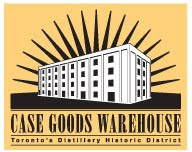 Please come by and visit us at the Distillery District Wednesday - Sunday Noon to 5pm. The latest project I've finsihed in my Shao Pin class... Also of note, he is hosting a show called Connection at his studio in the Distillery on behalf of Zilberschmuck . It's the 5th annual national juried exhibition of Canadian fine jewelry and metalwork. Show runs from April 19 to May 30. Thanks to my wonderful boyfriend Trevor Bond, we have a brand new website for the studio. Please check it out www.tankstudio.ca - we've got lots of info on classes plus more international guest teachers coming up. Read about the various artists who's work we carry at the shop. We'll continue to blog about the studio and stuff going on but our new website will be the main source to find info about us from now on. 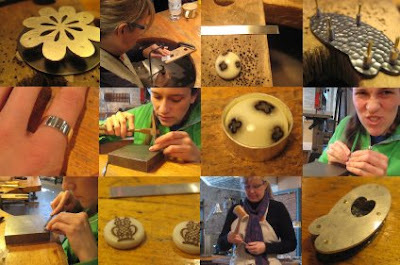 Jill and I are taking a metalsmithing class right now with Shao Pin Chu at his studio here in the Distillery. It's fun but also hard work and very different from the instant gratification of glass. However it's very satisfying to complete the projects and challenge ourselves with something new. I'm very excited by testing my hand at a new skill. Above are a few pics from the last 6 weeks. I just added lots of new beads to my etsy shop yesterday... and there's more coming!